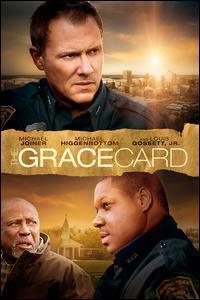 The Grace Card releases today (August 16) on DVD. I have wanted to see this movie since it came out in theaters. Friends had told me it was very good. Last night I watched it with great expectations. In a powerful way, the film dealt with sin on many levels such as race, pride, and anger. But in contrast, the film showed the prevailing love of God through grace, mercy, and forgiveness. The message of grace flows throughout this movie. It is a beautiful picture of the ultimate grace that was given to mankind. “For by grace are ye saved through faith; and that not of yourselves: it is the gift of God,” Ephesians 2:8. The movie is rated PG 13 for violence. Parents will need to use discretion in allowing younger children to watch the movie. However, it can be used as a great teaching tool for older children in that it shows the reality of this sin laden world and consequences that follow. *I am giving away a DVD of The Grace Card to one of my readers on Monday, August 22nd. To enter, just leave a comment on this blog about what God’s grace means to you and I will draw one winner. Everything can change in an instant … and take a lifetime to unravel. When Mac McDonald loses his son in an accident, the ensuing 17 years of bitterness and pain erodes his love for his family and leaves him angry with God … and just about everyone else. Mac’s rage stonewalls his career in the police department and makes for a combustible situation when he’s partnered with Sam Wright, a rising star on the force who happens to be a part-time pastor and a loving family man. Mac’s home life is as frightening as anything he encounters on the streets of Memphis. Money is tight and emotions run high as he constantly argues with his wife and his surviving son Blake, who is hanging with the wrong crowd and in danger of flunking out of school. Sam Wright also never expected to be a police officer. He has a calling—to be a minister like his Grandpa George. But leading a small, start-up church doesn’t always put enough food on the table for a young family, so Sam doubles as a police officer. With his new promotion to Sergeant, Sam starts questioning if his real calling might actually be police work rather than the pastorate. Can Mac and Sam somehow join forces to help one another when it’s impossible for either of them to look past their differences—especially the most obvious one? “And be ye kind one to another, tenderhearted, forgiving one another, even as God for Christ’s sake hath forgiven you,” Ephesians 4:32. “For if ye forgive men their trespasses, your heavenly Father will also forgive you: But if ye forgive not men their trespasses, neither will your Father forgive your trespasses.” Matthew 6:14-15. If you live within driving distance of Springfield, MO I have an opportunity for you! Next Thursday, August 11th, there will be a pre-screening of the upcoming movie, The Mighty Macs and I am giving away tickets to five of my local readers to this exclusive screening. The screening will be held at Wehrenberg Campbell 16 Cinema at 7 p.m. 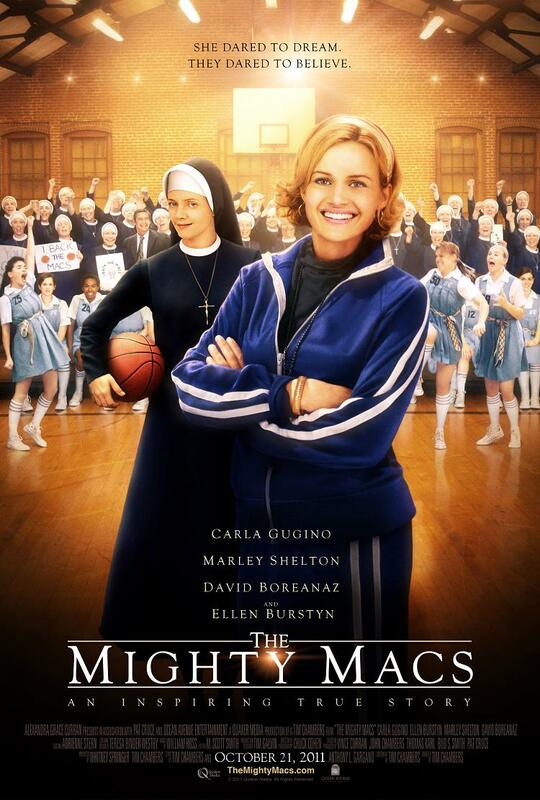 The Mighty Macs Movie is coming to theaters October 21st. It is the true story of women’s basketball coach Cathy Rush. Coach Rush led her team, the Mighty Macs on an incredible journey in 1971. If you are looking for a great family movie night, this is the film for you! You can watch the trailer at www.themightymacs.com. To win simply be one of the first five people to leave a comment and I will have an e-vite sent to you! Movie synopsis: She Dared to Dream. They Dared to Believe. It’s 1971. Cathy Rush is a woman ahead of her time … and she’s about to embark on an adventure for the ages. A new era is dawning in the country and in collegiate athletics, where a national champion will be crowned for the first time in women’s basketball. In the lead up to this historical season, major universities are preparing their game plans to win that first title. Meanwhile a tiny all-women’s Catholic college in Philadelphia has a more modest goal: find a coach before the season begins. Providentially, Cathy Rush is about to find Immaculata College. Recently married, Cathy is dealing with the aftermath of a truncated playing career. While cultural norms would have her staying at home, she’s willing to do the hard work necessary to help her new team reach their goals—or perhaps she’s just trying to achieve her unfulfilled dreams through them. From the beginning, her challenges are as imposing as the big-school teams Immaculata will face on the court. Cathy learns there is no gymnasium on campus, she receives little support from the school’s Mother Superior, and the school is in dire financial straits. To top it off, she may not even have enough players to field a team! While it appears the Macs don’t have a prayer, all hope is not lost. With the help of Sister Sunday—a spunky assistant coach—and the support of a booster club of elderly nuns, Coach Rush creates a new game plan that just might bring the team—and the school—together. THE MIGHTY MACS is based on the incredible true story of the 1971-72 Immaculata College team that started in obscurity but became the original Cinderella story in women’s basketball. This team of pioneers went from barely making that inaugural tournament to the first dynasty in their game. And Cathy Rush, the woman that was ahead of her time, became immortalized when she was inducted into the Naismith Memorial Basketball Hall of Fame. MIGHTY MACS opens in theaters on October 21. This Saturday, August 6th, “Who Is Simon Miller?” is set to debut on NBC at 8/7 c. This fast paced family spy drama brought to you by P&G and Wal-Mart is a part of their effort to bring more quality entertainment to families. Synopsis: When unassuming geologist Simon Miller mysteriously disappears one night, the Miller family is thrown into a desperate search to find him. Simon’s wife Meredith and their two kids, Sarah, 18 and Kevin, 15 frantically search Simon’s office for information. When they find a stash of passports, all with Simon’s picture but each with a different alias, they realize that their father has been keeping more than a few secrets. Who is Simon Miller? And what has he gotten himself – and his family – into? Not sure they can even trust the dad they thought they knew, the Millers embark on an international mission to get him back. It’s a heart-pounding adventure that tests the limits to which families will fight for each other. Disclaimer: I received access to watch “Who Is Simon Miller?” in exchange for an honest product review. I do not receive any other form of compensation for the reviews posted on this blog. Those of you who have followed my writings know how I feel about music. God designed it to stir your soul. Music will either stir your soul toward God or away from Him. This week as my family and I have listened to Robert Pierre’s newest album, I’m All In, our hearts have been stirred toward God! Robert is a very talented young man. In addition to writing, recording, and playing on a summer tour, he also leads regular Sunday morning worship at his church. And he’s done it all as a high school senior. I’m All In is his third studio album and is set to release tomorrow (July 26th). 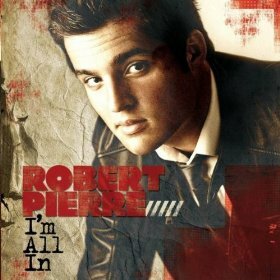 I am giving away a copy of Robert Pierre’s I’m All In to one of my readers. Just leave a comment and one week from the release date (Tuesday, August 2nd) I will draw a winner and have a copy sent to you. Tell your friends and increase your chance to win. Leave separate comments for each posting on social media (face book, twitter, blogs, etc) for additional entries. Disclaimer: I received “I’m All In” to review in exchange for an honest product review. I do not receive any other form of compensation for the reviews posted on this blog. Sometimes doing the right thing cost you something. I have seen this in my own life many times. And sometimes doing what is right involves standing alone. However, we should always stand on principle, though we may stand alone, we can cherish the sweet reflection that our voice will not be lost. For some time families have been voicing a need for someone to rise up to produce some family friendly movies. Families are tired of the (at best) questionable material that flows into American homes and (at worse) the outright filth produced. We want to be able to gather our children around a clean movie that gives more than mere entertainment but teaches solid morals. I must say that once again Wal-Mart and P&G have done it. They have brought to the airwaves another family friendly movie. I reviewed Field of Vision this week and for the most part I was impressed. The movie portrays the family structure as being strong, loving, and supportive. It sheds light on the problem of bullying in our modern school system and teaches that no matter the cost we need to stand up for what is right. There are some great lessons taught. One is that truth should always be upheld. Another is the power of our words, written and spoken. And an influential cord woven throughout the entire movie is friendship. My only complaint was that I did not care for the magical aspect of the mysterious video camera. It seemed out of place in the movie. However, the attention given to it was in small detail which left the viewers drawing their own conclusions. 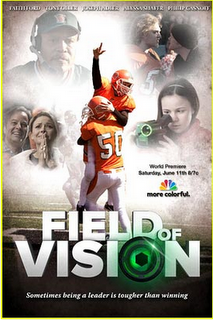 Field of Vision airs tomorrow (Saturday, June 11, 2011) 8/7 Central on NBC. Pop some popcorn and gather up your family. It’s a great opportunity to discuss some important issues in life while enjoying each other. Click here to view the trailer. Through mysterious footage captured on an old malfunctioning video camera, Sinclair High School’s star quarterback, Tyler McFarland, learns that some of his teammates have been bullying Cory Walker, a troubled new transfer student. Aware that sharing this information with the coach might get his friends kicked off the team and ultimately cost the school the state championship, Tyler must choose what’s more important: winning or doing what’s right. As these events unfold, the camera also reveals more surprising footage to Tyler’s kid sister Lucy. She learns that Cory has a secret past, unknown even to him. Now Lucy must convince her mom (Faith Ford, Murphy Brown) and family that the camera’s revealing insight is not a product of her imagination as she enlists their help to find the answers Cory so desperately needs. It’s a compelling and intriguing story that shows both the challenges and rewards of doing the right thing even when it’s tough to do. Disclaimer: I received Field of Vision to review in exchange for an honest product review. I do not receive any other form of compensation for the reviews posted on this blog. However, we ran into a challenge when our children started out reading us. 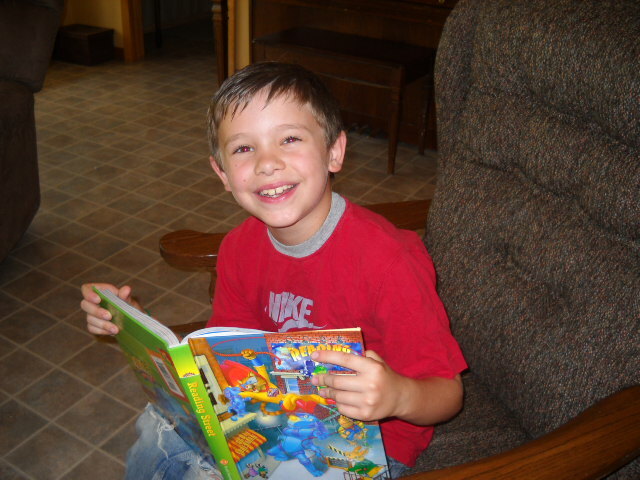 Aaron would pick up a book at the library and ask if he could read it. I would tell him to get the book and his father or I would read it first. But we got to the point where we couldn’t keep up with him. So, what is a parent to do? We solved the problem for a little while by finding authors we trusted. We would then let them read anything they had written. Again, we ran into problems there. For example, my children love C.S. Lewis’ Chronicles of Narnia series but there we just some of his books we did not wanting the children to read until they were older. If a parent wants to guard their children’s hearts they must sort through thousands of books to find those that are worthwhile. There is, however, another option. You can find a trusted source that has already done the work for you. Apologia offers the solution. Read for the Heart by Sarah Clarkson is a trusted guide in children’s literature. In her book she recommends over 1,000 stories for young people from the classics to modern favorites, picture books to adventure novels, and read aloud favorites. She shares her heart on reading and informs us of the literacy crisis here in America. Read for the Heart is a wealth of knowledge. If you would like more information about the book, visit Apologia to read a sample chapter. The book cost $17.00. To see what others are saying about this book, click here. Disclaimer: As a member of The Old Schoolhouse 2010-2011 Crew, I received Read for the Heart in exchange for an honest product review. I do not receive any other form of compensation for the reviews posted on this blog. When was the last time you looked at creation and reflected upon it? When was the last time you gazed into the sky and considered its vastness? When was the last time you looked at a tiny flower growing in the field and saw the hand of God? “When I consider thy heavens, the work of thy fingers, the moon and the stars, which thou hast ordained; What is man, that thou art mindful of him? 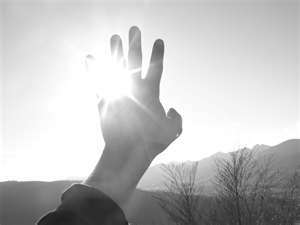 and the son of man, that thou visitest him?” (Psalm 8:3-4). When we consider such things we are drawn to God. Isn’t it amazing that true science always points us to the Creator? Yet, the enemy has used the fallacy in modern science to not only draw people away from God but to completely destroy people’s faith. Evolution is a false religion. It is based upon humanistic faith and masquerading as science. It saddens me to realize just how many children are daily indoctrinated in it. But what an absolute blessing to be able to teach my children the truths about the world God made! 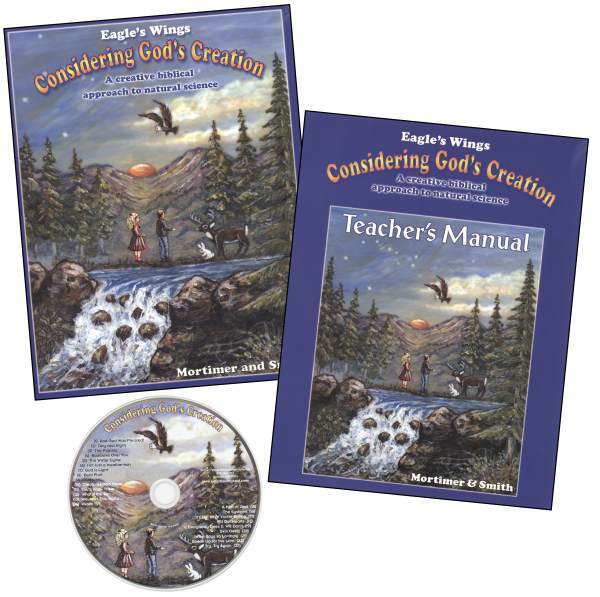 We have been going through a creative natural science curriculum from Eagles Wings Education Materials called Considering God’s Creation. This study is written entirely from a biblical perspective. It begins with creation, continues with the solar system, a study of the earth, first of non-living things, including rocks and weather. It then goes on with the Plant Kingdom, the Animal Kingdom, animal anatomy & physiology, and finally human anatomy and physiology. I really like Considering God’s Creation. There are 36 lessons that can be used alone or as a supplement for children through 7th grade. In addition to the 272 page book you receive a teacher’s manual and an audio CD. As a bonus, Considering God’s Creation is very reasonable priced at just $29.95. To find out more information visit their site. Or to see what others are saying click here. Disclaimer: As a member of The Old Schoolhouse 2010-2011 Crew, I received Considering God’s Creation in exchange for an honest product review. I do not receive any other form of compensation for the reviews posted on this blog. The other day, my husband and I were talking with a man who was considering homeschooling. I shared with him that teaching my children to read was one of the greatest blessings I have had as a mother. (That is aside from leading them to a relationship with the Lord.) Reading is such a foundational part of life. It has been said that great men are great readers. I believe that statement. Reading allows you to go places you’ve never been. It opens up the world before you. It inspires, teaches, and motives people to do great things. Reading allows you to learn from the past and plan for the future. These are the reasons I teach my children to read. However, the most preeminent reason I teach my children how to read is so they can read the Bible. Can you imagine not being able to read God’s Word? Did you know that there are people here in American like that? A few weeks ago we had a lady in our church get saved. I asked her if she had a Bible. She said she did but that she could not read it. My heart broke for her. How many people can read God’s Word but choose not to? That was not the case here. Listen, it’s not that she didn’t want to read her Bible, she couldn’t. 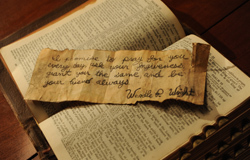 A person cannot spiritually grow without reading the Bible. So last night our family went to the local bookstore and bought this new believer an MP3 player with the entire Bible loaded on it. Because we have placed such an emphasis on reading, my older children are excellent readers. And Andrew is following up behind them nicely. Recently, we had the opportunity to review Scott Foresman Reading Street for 2nd grade. Most of you are probably familiar with Scott Foresman. When the books arrived I was very impressed with the quality of them. They are sturdy, hardbacks of just under 500 pages. The books are brightly colored and beautifully illustrated. Andrew has really enjoyed reading them. The books have activities, vocabulary words, and thought provoking questions for the student. For those teaching enthusiasts, there are even websites available (like this one) with additional Reading Street teacher resources like power points, downloads, and links. 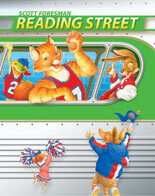 Reading Street is offered for pre-K to 6th grade. The 2nd grade books we reviewed (student edition, volume 2.1 and 2.2) cost $86.97. Or, you can purchase them individually for $43.47 each. The cost was a little too steep for our family but this was the only downside of these books. To see for yourself visit their site. To see what others are saying about Pearson Education click here. Disclaimer: As a member of The Old Schoolhouse 2010-2011 Crew, I received these books in exchange for an honest product review. I do not receive any other form of compensation for the reviews posted on this blog. My children love to read. But finding wholesome reading material that stirs my children’s imagination can be a challenge. You see, this mom doesn’t let her children have free range at the local library. It’s just too dangerous. I know what you are thinking. I’m being overprotective. Maybe so, but I have weighed the options. And I have came to the conclusion that I’d rather be too cautious than to have lies and misconceptions but into my children’s minds. So let me tell you about my newest discovery – The Circle C Beginnings Series. It is written by Susan K. Marlow, a homeschooling mom who lives in the state of Washington on a 14-acre homestead. You might be familiar with Circle C Adventures series for readers 9 to 14. This new series is written for children ages 6 to 8 who are ready to start their first chapter books. 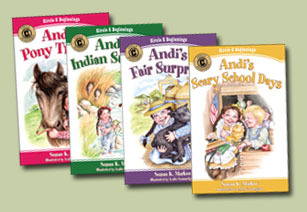 In this series you meet Andi Carter, a young girl who is eager to grow up and experience the Wild West of the late 1800s. With her baby horse, Taffy, she lives an exciting life on Circle C ranch. We were sent Andi’s Indian Summer to review. The book is a breath of fresh country air! It is as cute as can be, making you want to throw on some overalls and spend an afternoon wading in a cool brook. Best of all, I do not have to worry about the content of these books. In fact, in Andi’s Indian Summer, Andi learns that you must be careful what you read. A lesson still true for today! As an added bonus you can visit www.andiandtaffy.com for free coloring, activity, and lapbook pages. The books are a great price at $4.95 each. Or you can order all four in the series for $15.96 (+ $3 shipping). 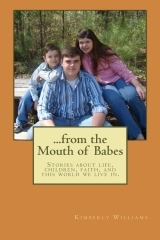 They are also available at Amazon, CBD, and Kregel Publications. If you have a young child and you are in need of some great reading material be sure and check out this series. You won’t be disappointed. 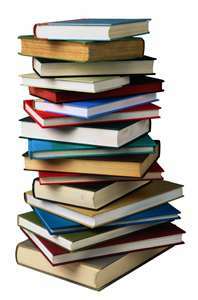 To see what others are saying about these books, click here. 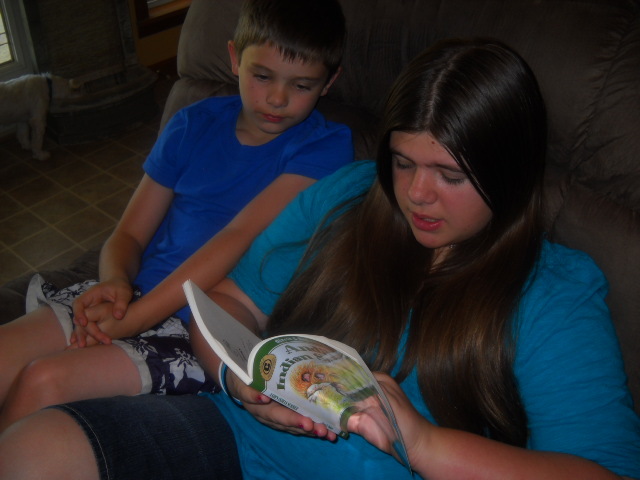 Here is Abigail reading the story to her little brother, Andrew. Disclaimer: As a member of The Old Schoolhouse 2010-2011 Crew, I received this book in exchange for an honest product review. I do not receive any other form of compensation for the reviews posted on this blog.